Damon Salvatore | "The only one I can count on is me." According to Ian, we're about to see Damon with a "new girlfriend"
are anda a fan of Elena and Damon? Best season for Damon so far? Is there anyone who that doesn't ship Damon with anyone (main character) in as couple? pilihan fans: No, I ship him with one of the main characters..
Make me choose ,Damon in a suit atau shirtless? Elena opened her eyes and gasped for air. She sat up and pulled the threads on her body. She climbed out of tempat tidur and opened the door. She covered her ears when she heard dozens of shoes stepping on the floor, people talking as if they were screaming through a megaphone. “Shut up!” she screamed and a few staff members turned around. “Are anda alright, miss?” a nurse asked. Elena shook her head confused. She leaned against the room. Everything was a blur. “I’ll get a doctor” the nurse and she looked around to find one. Damon looked around in the building, when he saw a silhouette. He rushed towards it and grabbed Veronica oleh her throat and lifted her from the ground. He threw her inside the fourth room where the api had started and locked the door. He heard her scream, but ignored it. Damon turned around and Elena ran towards him. She threw her arms around his neck and kissed him passionately. “We have to get out of here” she berkata when she let go. Damon threw her in his arms and rushed outside. Bonnie grabbed her head and fell on her knees. She’d been struck with a sudden brain attack and she imagined this was what Damon had felt when she attacked him. “Bonnie!” Matt exclaimed. He wanted to help her stand, but she raised her hand at him. She then stood herself. “I’m going to try” Bonnie replied determined. Veronica ordered them to stop in front of a stake. In the center there was a big pole where they were being tied onto. “Where’s Elena?” Damon begged to know. “She’s with her brother” Veronica replied. “Don’t hurt her. She’s sick” Damon appealed. “She’s just a girl. It’s not her fault she’s the doppelganger. She wouldn’t hurt a fly. She’d sacrifice herself for her loved ones anytime” Stefan tried to reason with Veronica. A couple of hours later Veronica unchained Damon. “Don’t even think about running” she berkata threatening. She opened the door and three of her minions appeared. They cuffed Damon’s hands and feet and when Damon looked up he saw Stefan, Katherine and Caroline were all chained onto each other. Veronica’s minions dragged Damon meneruskan, ke depan and chained him onto the rest. “Now, walk” Veronica ordered. They wouldn’t pindah and thus Veronica nodded at one of her minions. He fired a bullet and Katherine screamed. The door opened and Derek appeared. He gasped at the blood and the insides lying on the floor. “What happened?” he asked difficult. Veronica parked her car in front of her supernatural prison. She stepped out and walked to the back of her car. Two of her minions, guarding the entrance, came towards her to give her a hand. Veronica unlocked the bagasi, batang and the two men grabbed Jeremy’s arm. One of them confirmed that and she headed to the entrance. Rachel was pacing through the room where Caroline, Stefan and Katherine were captivated. Elijah walked through the woods. After some bickering with Rebekah they had agreed it would be safest if one of them, Rebekah, would stay behind and man the headquarters, while the other, Elijah, would go back to Esther’s grave. He removed the stone and climbed downstairs. Two coffins were still closed. Elijah walked to the coffin that stood on the left side of his. He opened it and revealed the body of his oldest brother Finn. 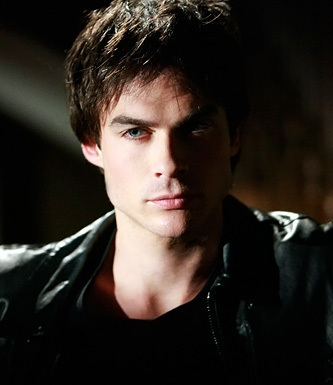 Find out all about how Dr. Maxfield plans to turn Damon into his secret weapon of mass destruction. Will this new Damon storyline break up Damon and Elena? a comment was made to the question: Have your baru saja dreams included Damon Salvatore? a comment was made to the pop quiz question: "Why do anda get a happy ending, and I don't?" Who is Damon confronting? Match the quote to the episode:"Damn, you're strong for a little thing."